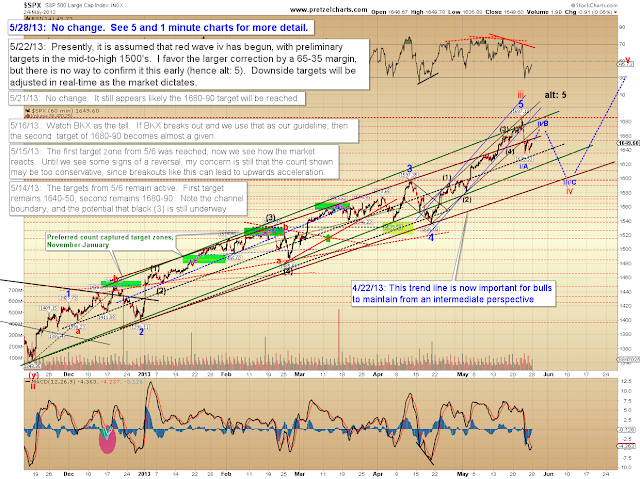 Pretzel Logic's Market Charts and Analysis: SPX Update: Time to Sell the Bounce? 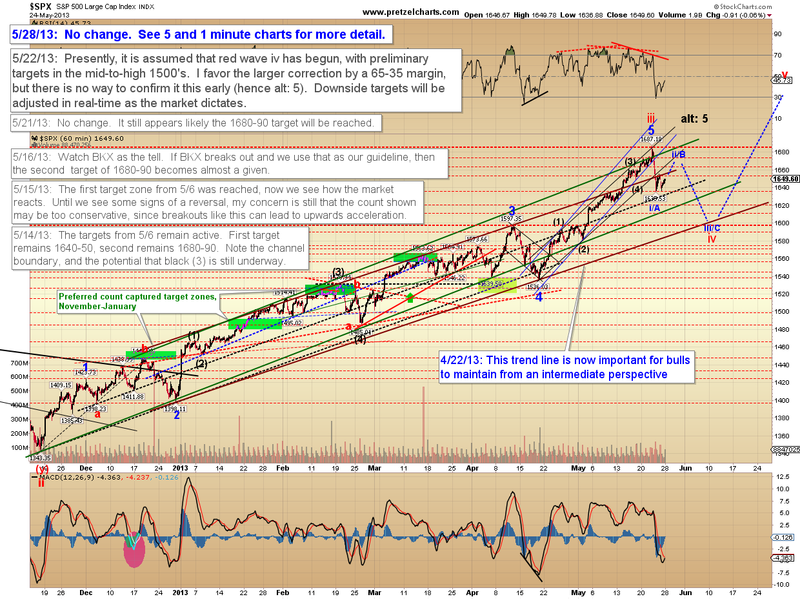 SPX Update: Time to Sell the Bounce? Enough to base a movie on? It feels like we've been here before. And I think bull are expecting that we have -- and thus expecting new highs immediately. But this time, I suspect that won't be happening just yet. The recent decline is the cleanest downward impulse this market has seen in a long time, and that means we "should" have another leg down of at least equal length. 2) As Madonna would say: "We're still livin' in a QE-world, and Ben is a QE-girl." The last time we had a nice downward impulse, it turned out to be the c-wave of an expanded flat, and the market went straight on to new highs -- but I have a hard time seeing that pattern in this current wave. Doesn't mean I'm right, of course. The Fed and the Bank of Japan are both flooding the market with liquidity, so maybe I'm nuts to even expect a correction under these conditions. Right or wrong, I simply have to follow what I see in the charts. Speaking of, the first thing the charts suggest, for the short-term at least, is higher prices. 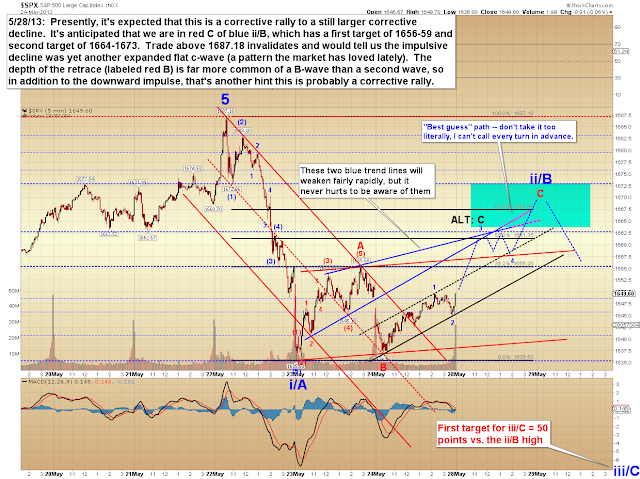 Note the market can travel all the way up to 1687 and still maintain this wave count. I would expect 1664-1673 -- so there's about 14 points of no-man's land above the target zone where things become fuzzy. 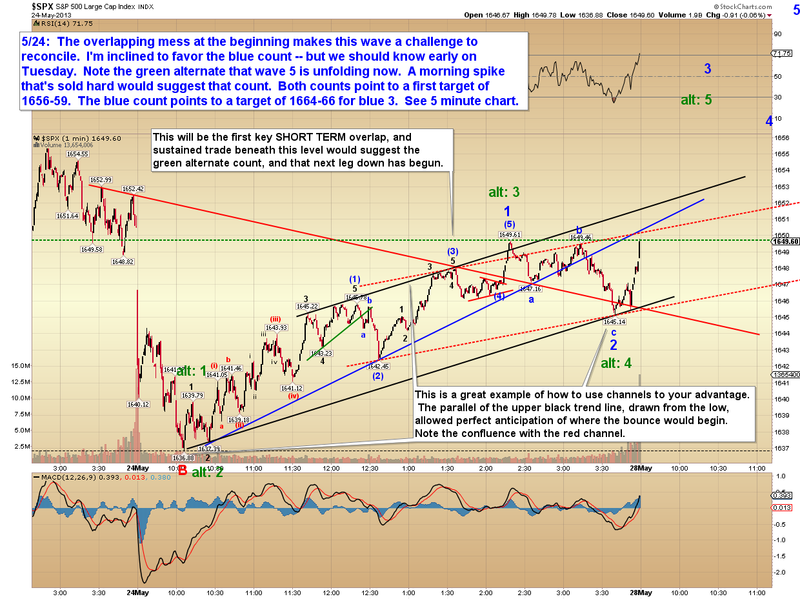 A bit more detail on the one minute chart, and a look at an alternate near-term count. I like the preferred count better (obviously), but I try to note the alternates mainly for the benefit of readers to be able to quickly figure out what's happening in the event my preferred count is wrong. 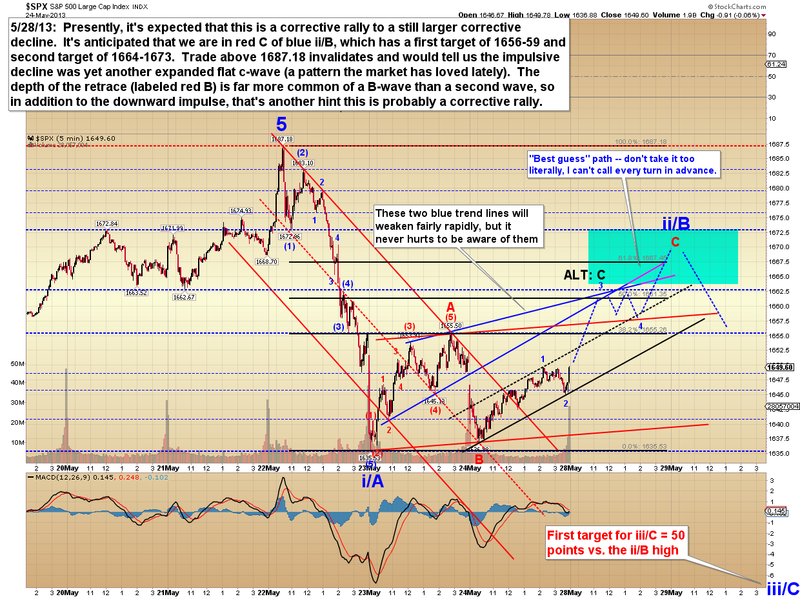 The hourly chart roughly outlines my expectations across three time frames. And it's worth noting that the intermediate and long-term trends can both give a lot of ground to the downside without creating too many issues for bulls yet. In the last update, I outlined a potential long-term bear count because we should always see both sides of the trade, but presently I expect this is simply a correction which will ultimately be followed by new highs. 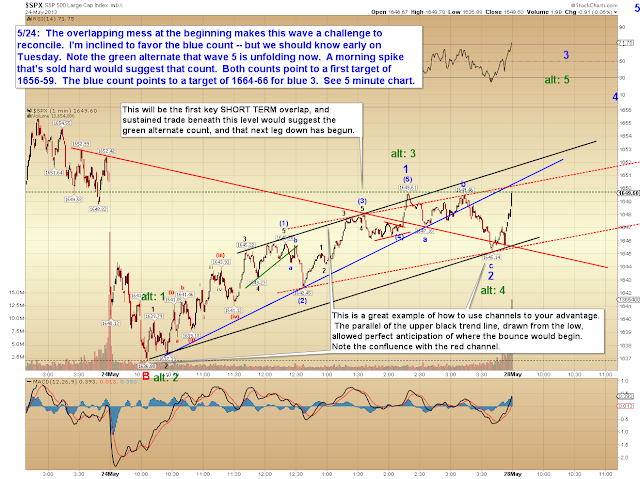 The first target for blue iii/C is 50 points against the prevailing ii/B high. We'll refine that target if and when we get closer. In conclusion, this update might get a bit confusing, so let's recap time frames: Near-term, I expect higher prices; intermediate-term, I expect lower prices; long-term, I expect new highs. The intermediate trend remains up, so it bears mention I'm projecting against the trend, which is always tricky business. And as always, the market reserves the right to force me to revise this whole thesis upon providing new price/pattern information. Trade safe. This is really so it can be covered inside the excavation instead of trenching it about. What makes you very much happy when the person are doing understand it?